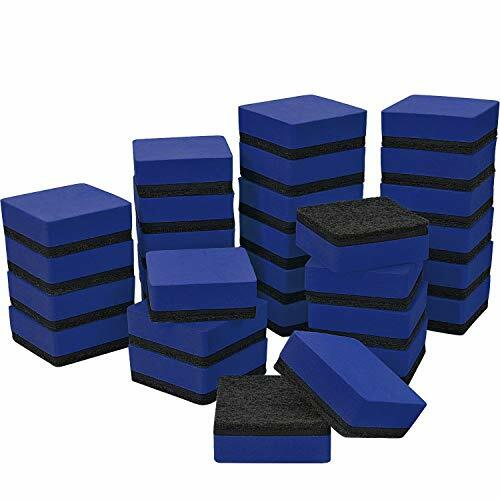 Lightweight and soft erasers, can be applied in classrooms as daily necessary. Erasers with soft magnetic can stick to metal surfaces like metal whiteboard, chalkboard and so on. To clean the whiteboard easily and effectively, you could press the erasers a little bit harder. Compatible with white/ black boards, dry erase sheets, melamine, porcelain and glass surfaces, to clean the whiteboard effectively, you need to press the erasers a little bit harder. Because of different batches, they may exist some extra felt on the surface when you receive, please blow them with blower or fan.